You’re gonna get my view of things, which is not left-wing or right-wing. It’s just my view … That’s what art is—you put yourself on the line. DC Moore Gallery is pleased to present Roger Brown: Political Paintings. Spanning the years 1983 to 1991, the work on view provocatively addresses the defining political, social, environmental, and economic crises of the era. A catalogue accompanies the exhibition, featuring an essay by Lisa Stone, Curator of the Roger Brown Study Collection of the School of the Art Institute of Chicago. Brown’s paintings deliver biting commentary on the Gulf War, the HIV/AIDS pandemic, and the Savings & Loan industry collapse and bailout through inventive use of luminous color, silhouetted figures, stylized natural forms, and dramatic shifts of scale and perspective. “Impelled by current events and keenly sorting through the assorted forms of news media⎯from standard newspapers and TV coverage, to sensationalized tabloids and talk shows⎯Brown observed and responded to current events as they unfolded,” Stone writes. In The War We Won (1991), four life-size politicians mark the end of the Cold War with stiff smiles and an unconvincing handshake, while another conflict escalates in Gulf War (1991). 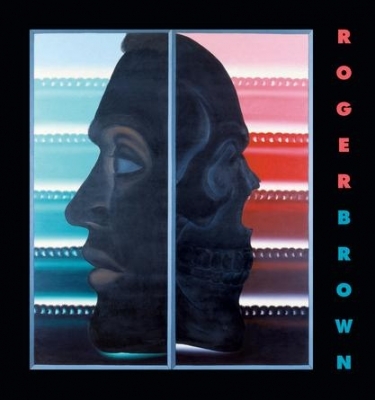 Roger Brown (1941-1997) grew up in Alabama, where he developed an interest in the material culture of the South. He earned BFA (1968) and MFA (1970) degrees from the School of the Art Institute of Chicago. In the late 1960s, he participated in two exhibitions titled “False Image” at the Hyde Park Art Center, Chicago, one of several group exhibitions which followed the “Hairy Who” shows. In addition to painting, Brown created sculpture, stage sets, and murals and amassed three eclectic and inspiring art collections. He died at the age of 56 from complications of HIV/AIDS. Recent exhibitions of the artist’s work include Roger Brown at DC Moore Gallery in 2013; Roger Brown: This Boy’s Own Story at the School of the Art Institute of Chicago in 2012; Roger Brown: Urban Traumas and Natural Disasters at the Springfield Art Museum in 2011; and Roger Brown: The American Landscape at DC Moore Gallery in 2008. From 2007-2008 the exhibition Roger Brown: Southern Exposure traveled to Jules Collins Smith Museum of Fine Art at Auburn University, Alabama; The Katzen Arts Center at American University, Washington, DC; and The Ogden Museum of Southern Art, New Orleans, Louisiana. Brown’s work is in the permanent collections of the Art Institute of Chicago, Illinois; Whitney Museum of American Art, New York; Museum of Modern Art, New York; Metropolitan Museum of Art, New York; Smithsonian American Art Museum, Washington, DC; Los Angeles County Museum of Art, California; Scottish National Gallery of Modern Art, Edinburgh; and Museum Moderner Kunst, Vienna. Art in America: "Roger Brown: Political Paintings"
Observer Arts: "The Top 10 NYC Gallery Shows of 2015: Roger Brown"
Artnet: "David Ebony's Top Ten Gallery Shows: Roger Brown"
Observer Arts: "Roger Brown: 10 Things to do in New York's Art World"